ABC End of the Year countdown- take 2 | My Attempts at Being Creative! So, last year the idea of a countdown to the end of the school year was a spur of the moment decision without much thought and planning put forth. This year I contemplated doing a countdown or not (I’m teaching with a new co-teacher so I wanted to make sure I wouldn’t be stepping on toes if she already had something planned). In the end I decided to do the countdown in the ABC format, they’re kindergarten so it makes sense. I made the punch out board a little different this year and I LOVE how it turned out so much more than the one I created last year. This year I went to Dollar Tree and purchased a tri-fold board, snack cups, and tissue paper in rainbow colors. Next, I laid out the 26 snack cups on the tri-fold board to see how it would all go together. I traced around the inside lip of the snack cups so this way I could just slide the containers in and not have to worry about students punching the cup out of the board. Also, this allows me to reuse everything (except the tissue paper) each year. 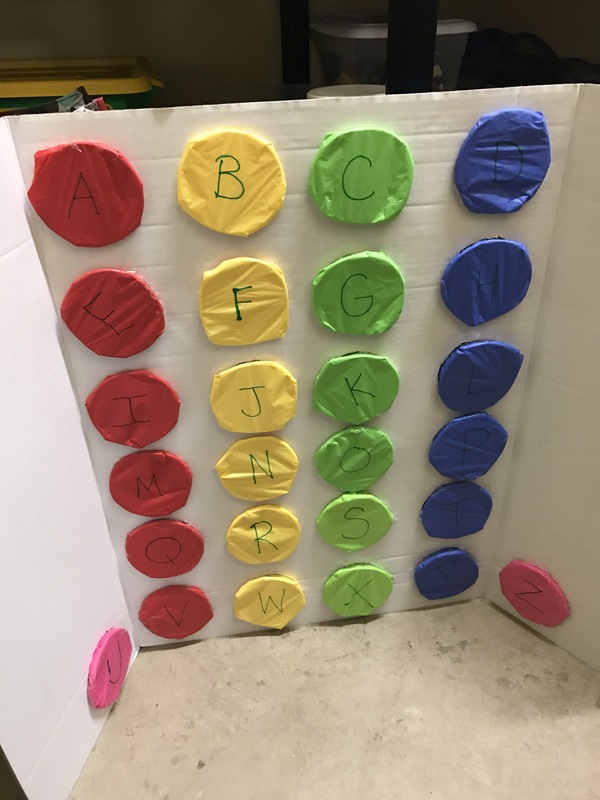 I used a box cutter to cut the circles out and then placed a slip of paper that read the daily letter and what it stands for. For example one paper says B is for Balloons and another would read G is for Games and Gum. It is not the cutest board but it gets the job done. For next year I will probably decorate the board before we start the countdown to make it more visually appealing. Here is the letter that I send home with families before we begin to let them know what we will be doing each day. Some days require bringing something from home. Click for end of year countdown 1. I will let you know it is not the prettiest of things but it gives you an idea of what we are doing in my classroom.